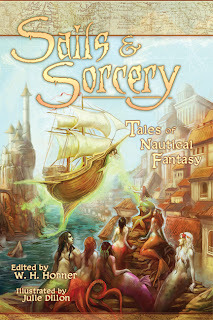 You can now preorder a copy of Sails and Sorcery, which also has my short story Stillworld: Sailing to Noon over here. I've been racking my brain over how to market this thing but I just wasn't sure until a moment of brilliance hit me. Instead of telling you that it is a short story anthology with some bigtime authors giving you a bunch of great adventures in the high seas and then telling you how awesome it is just for the wonderful pictures done by Julie Dillon. I decided to just threaten you. That's right, my new marketing strategy is to just punch you if you don't have a copy of Sails the next time I come to visit. Brilliant isn't it? I so hate the begging you to buy my anthology approach. I mean it degrades the book if I have to beg you to take a look. It's got freakin pirates doing magic and stuff in it, it doesn't need your pity; I just need to threaten you with a punch in the gut. So everyone who knows that I'll be making a visit sometime in the future, I'm talking to you folks in Columbus in Sept and SoCal in Dec, you better have a book in your hands when you greet me or you'll be surprised with a punch in the gut. Now maybe you're an old lady with arthritis and you're saving your money to have heat this coming winter. You think you would be exempt from the punch in the gut marketing plan, yes? No! I'll give you a punch in the gut just like anyone else and I'll even add a little sting to it for thinking you would be exempt. Now there are a few of you who could take a punch in the gut from me. I'm not the greatest puncher in the world after all. Maybe you think you can take it. If you do so then I'll just introduce you to the second half of my great marketing plan, a kick in the face. I just bought me a pair of steeltoes baby, you don't want to see a kick in the face from me even if you are an NFL linebacker or UFC fighter. Anyways, why don't you just save me a lot of grief and exertion and buy the thing? Here's the cover, it's pretty with mermaids and stuff and much better to have than a black eye. I love it! Here I've been trying contests and bookmarks and the like. Your route is so much more direct!